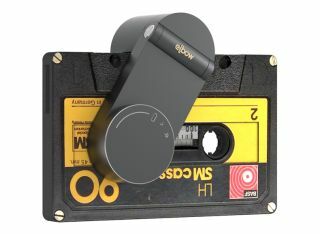 Elbow cassette player concept could spark tape revival | What Hi-Fi? The concept strips back a cassette player to its bare basics. But could it help bring back the humble format? Vinyl may be enjoying a resurgence, but what about its successor, the cassette tape? If cassettes are due a comeback, this could be the device to help the revival along. Elbow is a design concept for a new type of cassette player. It was first revealed a while ago, but now its creator is investigating the logistics of putting it into production. Stripping the cassette player back to its basics, Elbow has no box to house the cassette, instead there's an arm containing a single pulley to drive the tape (regular cassette players have separate pulleys). The speed of the tape is tracked by an optical sensor, with the motor keeping the speed constant. The biaxial arm rotates in two directions, letting you play both sides of the tape. Turn the control wheel to start the device playing, and turn it more to increase the volume. Turn it in the opposite direction, and you'll fast forward with a gradual speed increase - the further you turn, the faster it will go. Elbow has a standard 3.5mm headphone jack as well as a mini-USB port for transferring audio to a computer. The makers claim that Elbow helps listeners gain a new appreciation for music on tape. "By exposing the cassette to the elements, Elbow offers a fresh user experience, allowing the listener to directly appreciate the mechanical motion," they write. "The music player becomes more like an additional element - in a way, the cassette plays itself." The concept has won a couple of awards, including one from Industart, the International Industrial Design Awards. We'll have to wait and see if it ever makes it to market.